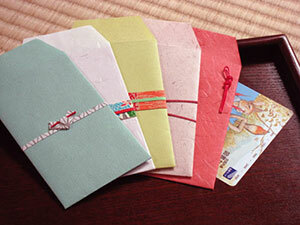 Most travel guides on Japan state that it is not customary to give tips. As gratuity is already included in bills and prices in the form of a 10 to 15 per cent service charge, many are not aware of the fact that they do pay tips. Therefore, the notion of “service = free of charge” is deeply ingrained in Japanese minds. So while bellboys, waiters, hairdressers and even taxi drivers might raise their eyebrows at your tip or even outright reject it, some practices equivalent to tipping still exist in Japan. Examples are chadai (茶代, tea money) or kokorozuke (心付け, lit. gratuity) in high-end Japanese restaurants and ryokan (旅館, traditional Japanese inns). Contrary to tipping in Western countries, chadai or kokorozuke is subject to certain formalities: the tip has to be “wrapped” in paper or enclosed in “tipping bags” called shugibukuro (祝儀袋). Handing out bills or coins without envelopes is considered to be entirely improper. Another aspect different from Western tipping is the timing: kokorozuke is given before receiving service, as it is part of the greeting or requesting ritual. Less formal procedures of tipping pertain to taxi drivers: in their case, it is not required to wrap tips. The same rule applies to bus drivers and tour guides. However, often tips are prepaid gratuity included in the overall travel fees. Japan is without a doubt world leader in “public toilet density”. While almost all public facilities in Japan are free of charge, some municipalities have recently started to request users to pay tips at public toilets located in remote mountainous areas or in sightseeing spots off the beaten track to cover their waste disposal costs. Some people tip movers handing out “food money”. In hospitals, there is an unspoken habit of tipping doctors or nurses under the guise of kokorozuke, usually as a means of securing the services of a prominent surgeon. In recent years, the number of critical voices denouncing such practices as a blatant violation of professional ethics have been increasing. Therefore, many hospitals have resorted to stating unmistakably that they will not accept any gifts from patients or their families. Giving out kokorozuke to public officials is considered bribery under Japanese law. Let’s take a closer look at the two most likely situations where tipping might be called for, namely the ryokan (traditional Japanese inn) and moving companies. Kokorozuke at the ryokan: necessary? The answer is no. Since ryokan charges include service fees, there is no need for tipping. Even in the case, there is no service fee put on top of prices, it should be considered inclusive, so there is no actual requirement for tipping. However, in case you are to ask for some special favour beyond what can usually be expected at a ryokan, you better prepare a tipping bag. You are not satisfied with your room and ask for another room that happens to be of a higher grade but at the same price. You are to have a party and bring your drinks without paying any surcharge. You have difficulty walking and have to ask for someone’s assistance every time you move around the inn. You or your children broke a shoji door (障子, paper screen), soiled the futon or damaged the tatami mats. In this case, you are supposed to pay some compensation. However, if the ryokan management refuses to accept your compensation, you are supposed to give out some kokorozuke to show your feeling of regret and gratitude. In general, you will give it to the employees working at the inn. The point here is to whom you should give so that you can get “most benefit”? If you want a nakai-san (仲居, serving lady) to do you demanding favour, then you will present kokorozuke to her. In a small ryokan, even if you request a favour of a nakai-san, and it is the master or the okami (女将, the madam of the ryokan) fulfilling your request, in the end, you will tip either. They might consider you a regular! I have some favours to ask of you. Iroiro to muriwo onegai shimasu ga yoroshiku onegai shimasu. The amount of kokorozuke depends on the number of people you are staying with, the room charge, and the kind of favour you are to ask, round figures like 1, 2, 3, or 5 are considered to be appropriate. It is often said that room charges and kokorozuke are proportional. However, it is quite rare for kokorozuke to exceed 10,000 yen unless you are part of a large group or stay in a top-notch ryokan. Two-thousand to 5,000 yen is the usual range of kokorozuke, with 3,000 yen the most common. If you decide to tip movers, make sure you to identify the foreman, and in front of all the movers, present him with a tip that is equivalent to 1,000 yen per person. That way, you can avoid the foreman pocketing the entire tip.